Illustration credit & copyright: Michael Zeiler. Where will you be for the Great American Eclipse on Monday, August 21, 2017? This event will be seen in various forms across the entire contiguous United States and will likely be the most viewed eclipse in history. NOTE: It may sound cliché at this point, but do not look at solar eclipses (or the Sun in general) without eye protection that’s designed for looking at the Sun. Anything other than this may result in permanent eye damage to you or a loved one. If you need to know where to get them check these links or ask me. You can get a pack of 25 for about $30 (If you’re paying much more than that you’re being ripped off IMO.) so no excuses! Eclipse Glasses – Charlie Bates Solar Astronomy Project – Non Profit Educational Outreach. We’ll Donate a Percentage of the Sale Back to The Charlie Bates Project. Where can I see it from? The path of totality (where you can see the total eclipse) is set to begin a few thousand miles west of the U.S. in the Pacific at about 16:48 UTC. Unfortunately, neither Hawaii nor Alaska will see totality on this eclipse. The 70 mi. 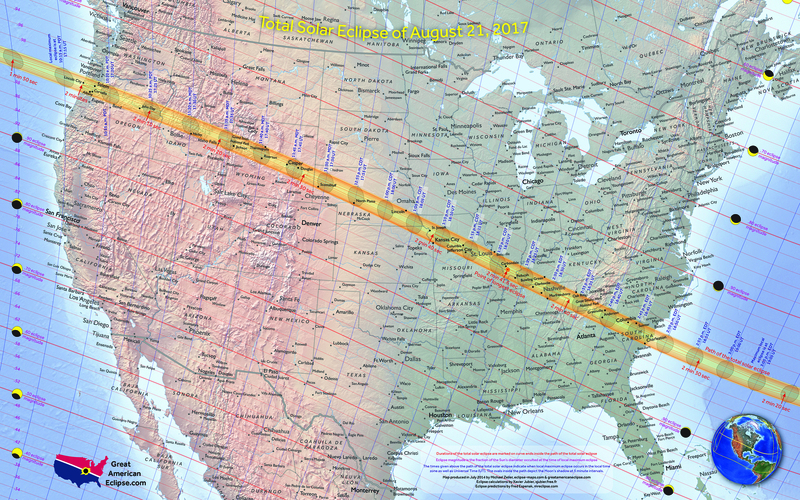 (112.6 km) wide path of totality will make landfall in the contiguous United States around Depoe Bay, Oregon (close to Salem, Oregon) at 17:16 UTC (10:16 PDT) and will be seen for about two minutes. It will then travel across the United States in roughly 90 minutes before exiting through McClellanville, South Carolina at about 18:50 UTC (14:50 EDT). The point of longest duration will land near Carbondale, Illinois with totality beginning at 18:20 UTC (13:20 CDT) and ending at 18:23 UTC (13:23 CDT). That’s a totality that will last for about 2m 40s which is fantastic. Just for fun, the longest totality possible is about seven and a half minutes! Illinois also has the privilege of being the overlap point of the August 21, 2017 and April 8, 2024 total solar eclipses. A partial solar eclipse will be seen for many hundreds of miles to either side of totality so if you can’t place yourself under it, you should still see a pretty good partial solar eclipse as there will be different gradations of partial eclipse visible to you depending on where you’re located. The closer you are to totality, the greater the partial eclipse will be. Conversely, the further from totality you are the less partial the eclipse will be until you get further enough away that you won’t see an eclipse at all. That being said, unless you’re in the U.S. or on a ship or in a plane in the Pacific or Atlantic, the only way you will be able to see this eclipse is after the event, in the images people capture and later in a movie called “Eclipse Megamovie 2017” which should be spectacular. You will also likely be able to watch the eclipse on a live feed from Slooh. I’ve posted all links below. 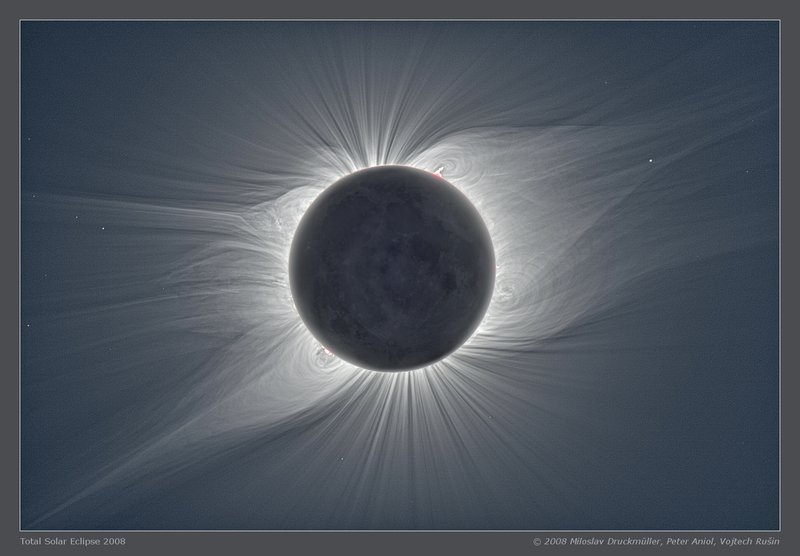 2008 Mongolia eclipse composite by Miloslav Druckmuller, Peter Aniol and Vojtech Rusin. A solar eclipse is when the Moon passes in front of the Sun, blocking out much of the Sun’s light. To cover the bases, I will also add that a lunar eclipse is when the Earth gets between the Sun and Moon, preventing much of the Sun’s light from reaching the Moon. These events can happen because the Moon is 400 times smaller than the Sun but the Sun is 400 times further away thus, they are almost exactly the same size on our sky. This is all pretty simple as a concept but the details come in varying degrees. There are total solar eclipses which is when the three bodies are lined up nearly perfectly so that most of the Sun’s light gets blocked. You also have partial eclipses and those are solar and lunar eclipses when the alignment of the three bodies isn’t spot on. For solar eclipses, the closer to totality you are, the deeper the eclipse will be. There are also annular “Ring of Fire” solar eclipses. This is when the Sun and Moon still line up almost perfectly but the Moon is slightly further away in its orbit to where it doesn’t completely cover the disk of the Sun. As Johannes Kepler discovered a long time ago, orbits are not circular, they’re elliptical or slightly oval. In the Moon’s case, its average distance (semi-major axis) from Earth is about 238,000 miles (382,900 km) but also during each cycle is has times when it’s closer (perigee) and further (apogee) from Earth. Let’s look at the extremes using 2017 as an example. The Moon will get as close as 221,958 miles (357,207 km) during perigee on May 26 and it will be as far away as 252,651 miles (406,603 km) during apogee on December 19. That’s a difference of more than 30,693 miles (49,395 km). If you’re able to put yourself in position to see the total solar eclipse, the most important thing that I can tell you aside from safety is, make sure you actually watch the eclipse. So many people attempt to image eclipses and that’s great, I will be as well. But if you do, be practiced and have your game plan so you spend as little time as possible working with your gear so you can maximize your experience. There are a number of things to observe that only a total solar eclipse can provide. One is the 360 degree sunset. During totality, as you are in the Sun’s shadow, it will resemble sunset in all directions out on the horizon. Also, you will likely feel a noticeable change in air temperature during totality. If you can, try to take note of the temperature before, during and after totality and see if the change surprises you. Another amazing phenomenon that occurs during the partial eclipse phase are the shadows cast on the ground through trees and small holes in objects. Normal shadows will be replaced with shadows of the solar eclipse itself. Find a small tree or bush, grab a colander, poke a few holes in cardboard or even interlace your fingers. The shadows on the ground will all be in the shape of the eclipse. Image | This entry was posted in Astronomical Events, Astronomy (Learning), Eclipses (Solar & Lunar), News, Solar System, Video and tagged 2017 Eclipse, Astronomy, Astrophotography, Eclipse, Eclipse 2017, Great American Eclipse, Michael Zeiler, Miloslav Druckmuller, Peter Aniol, Science, Solar Eclipse, Space, Total Solar Eclipse, Totality, Vojtech Rusin. Bookmark the permalink.